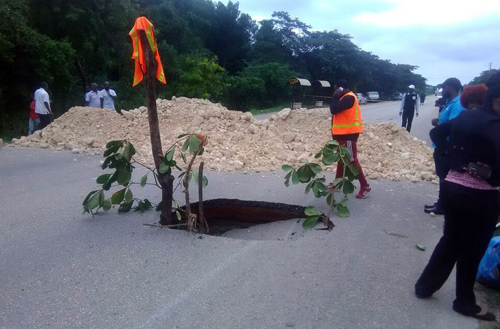 Up to press time, a team from the National Works Agency (NWA) was feverishly working on a temporary fix for the collapsed section of the North Coast Highway at Hague in Trelawny, which has caused a chaotic traffic situation in the town, never before seen in the parish. The Works Agency attributes the collapse to heavy rains in the parish in recent days which caused debris to clog a major drain in area, resulting in the partial collapse of the road in the vicinity of the Trelawny Multi-Purpose Stadium. A technical team carried out an inspection on Wednesday and found that the entire width of the road was undermined and likely to cave in under the weight of a passing vehicle. The road was then blocked off and traffic diverted through the town of Falmouth. That’s when the chaos set in as even with the efforts of the police to direct a smooth flow, the unruly behaviour of some motorists further exacerbated the situation with persons being stuck in traffic for hours. At one point, motorists were granted access to traverse through a nearby housing scheme in a bid to ease the situation somewhat. The incident happened on a Wednesday, the busiest day of the week in Falmouth, with the popular Bend Dung Market in full swing and two cruise ships in harbour at the world-famous Falmouth Pier. Reports are that the ships had to delay their departure as some passengers returning from their excursions were caught up in the traffic. In the meantime, the NWA is advising persons in Trelawny to exercise caution while travelling through sections of the parish, which have been impacted by significant flooding. The areas include Clarkes Town, Long Pond, Jackson Town and Level Bottom.